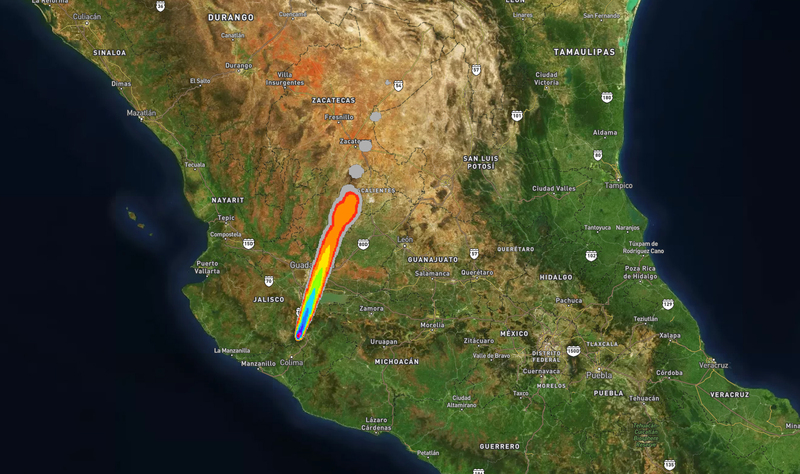 This app, put together by 2017 Ecometrica Award Winner Beth Gillies, shows the potential ash fallout from an eruption by the Volcán de Colima, also known as Volcán de Fuego, one of the most active volcanos in Mexico and in North America. In recent years there have been frequent temporary evacuations of nearby villagers due to threatening volcanic activity. Eruptions have occurred in 1991, 1998–1999 and from 2001 to the present day, with activity being characterised by extrusion of viscous lava forming a lava dome, and occasional larger explosions, forming pyroclastic flows and dusting the areas surrounding the volcano with ash and tephra.